We had a great afternoon in Oxford and Banbury with our free public viewings of the transit of Mercury. Mercury transits occur about a dozen times every century, and ones visible from the UK are even rarer, so HCO teamed up with the Museum of the History of Science to run observations for this rare event. Several hundred people were able to see the sun through our various telescopes (with solar filters specially made for the event), projections and solar scopes. We are pleased to announce that HCO will be teaming up with the Museum of the History of Science to run free public astronomy events for a rare astronomical event. The planet Mercury passes between the Earth and Sun about a dozen times every century, appearing as a dot crossing its surface. 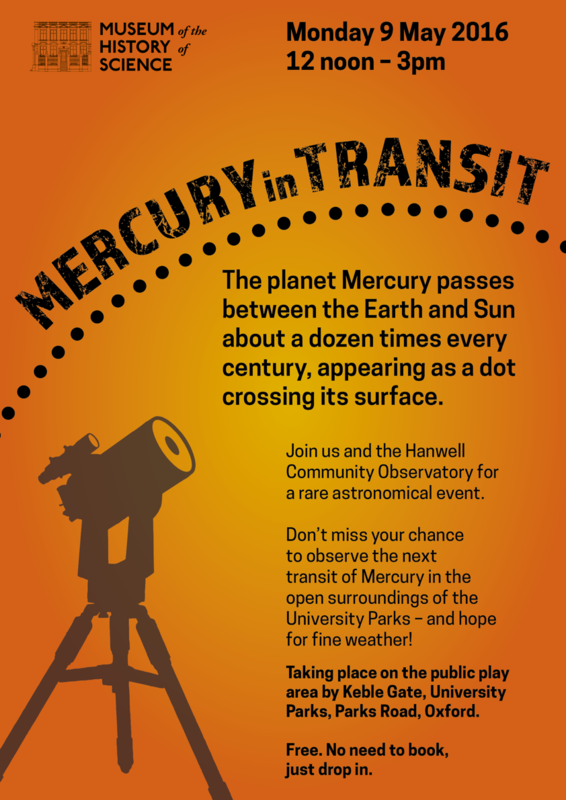 Don’t miss your chance to do some rare daytime astronomy to observe the next transit of Mercury! As always, never look at the sun with the naked eye and never observe the sun without the proper equipment. Both events are completely free, so just drop in any time between 12 noon and 3pm. The next entire transit of Mercury visible from the UK isn't for another 23 years, so make sure you don't miss your chance to observe this rare event!